Masters of the ultra-high-quality, beyond-esoteric, near-obsessive reissue, Chicago’s Numero Group takes a sharp left turn in its usual trailblazing through the tarpits of musical history to spotlight an era and a sound that previously have been lost to the sands of time: those early days of heavy metal when blues and psychedelia were first being melded in imaginative ways to form a new genre; when kids in American basements were putting their own Midwestern stamps on the early innovations of the Brits in Black Sabbath, Led Zeppelin, Deep Purple, and Uriah Heep, and when the haze of pot smoke parted to reveal by the light of the lava lamp sweaty-palmed fascinations with Dungeons & Dragons, The Lord of the Rings, Aleister Crowley, Anton Lavey, and other such artifacts of darkness that almost seem quaint in these post-Internet days. 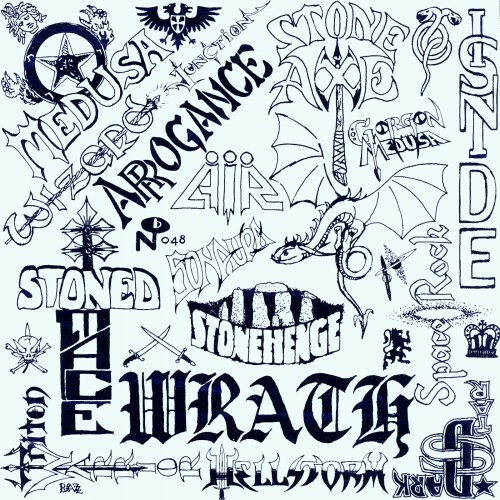 Warfaring Strangers: Darkscorch Canticles serves up 16 tracks from the early ’70s by bands with names like Wrath, Stonehenge, Wizard, and Gorgon Medusa. As on the early Sabbath albums, songs sometimes break down as a heavy-handed guitarist shifts from a massive riff to a tenuous lead; things stretch on for a few minutes longer than they should have; bassists solo when they should be grooving; drummers bash through passages emotive and operatic singers intended as moments of quiet drama, and the lyrics occasionally far surpass the cheesiest lines in Horrific: Weird Tales of Terror, It’s Midnight: The Witching Hour, and other classic horror comics of the day. But it’s this endearing amateurism, on-the-fly immediacy, and dare I say punk primitivism that make songs such as “Twelve O’Clock Satanial” by Air, “Sealed in a Grave” by Triton Warrior, and “Tasmania” by Stoned Mace so timeless, so appealing, and so much dang fun. Ultimately, this collection does for modern-day stoner rock what Lenny Kaye’s Nuggets did for punk in the ’70s, illuminating the sonic and spiritual predecessors, as well as arguing for an alternative aesthetic. And it’s every bit as vital to your collection.